First the health front has been very very bad the last to weeks. Of this I must say I am truly suffering with my bad behaviour. But my ideas are strong at the moment and I find that I let my health go when the ideas are strong. It seems that there is an inverse relationship between my idea prowess and my bad health. My reeling body forces thoughts to rise in my head. Which brings me to languages. I have been working very hard on my book and taken several of the ideas to learn Esperanto. The result is that the system feels like it is working. The beauty of the system I use is the the way it creeps up on you. Suddenly one day you find yourself understanding something and you have no idea when the ‘understanding’ really happened. You just wake up one day and you have it. Crazy stuff and I love it. Which brings me to the Krishnamurti’s. In fact there are actually two of them who look similar and talk about similar stuff. 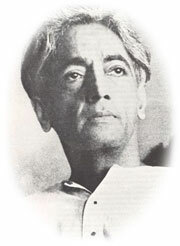 The guy I have been trying to understand for the last year is J Krishnamurti (who I will call JD), but there is another called UG Krishnamurti. Why do I need to tell you about this? It’s because they say fundamentally different things and I made the mistake of confusing them. For a short hour last night my thoughts were shattered. I asked my self how I could have put so much faith into JD when later he could say things so fundamentally different and with such a change in character. i couldn’t believe and decided to investigate, whereby I found an article by the late Osho which outlined the difference between the two. The funniest thing is that UG lived with JD for 7 years and they didn’t get along either. No wonder by brain was so revulsed when I heard the words of UG. Find below a picture of each man and note the difference! Moving swiftly on to Blaming America. Again a subject that I am fond of dissecting. Right, firstly I had a long ride to Abu Dhabi with one of my uncles day before yesterday, in which he spent a substantial amount of time cursing the Americans. Then a dinner last night with other close family cursing Americans. America this, America that. The spend beyond their limits. They created the credit crisis, blah blah blah. But I ask, what about the rest of the world? Did you not know about the American situation? I remember reading about American debt while I was in college over 9 years ago. It was obvious then that they were spending more than they could afford. Did all the pundits, doctorates, politicians miss what a 23 year couldn’t. What about China, investing like crazy to export to America or India which until a month ago was trying to do the same. Why was the motive for growth so strong that one couldn’t see the obvious? Now they want to blame the Americans for giving them stuff after soliciting them! After 20 years of exporting to America under dubious contracts, after investing in their equities and enjoying the profits, you wish to blame them. If anything, they have been very open about what they are doing. Just no one wanted to listen. The going was to good! And now that it isn’t we can blame them! I love it. b) almost 20% of total global GDP! So here’s America’s message to the world right now: Buy your own goods for a change!